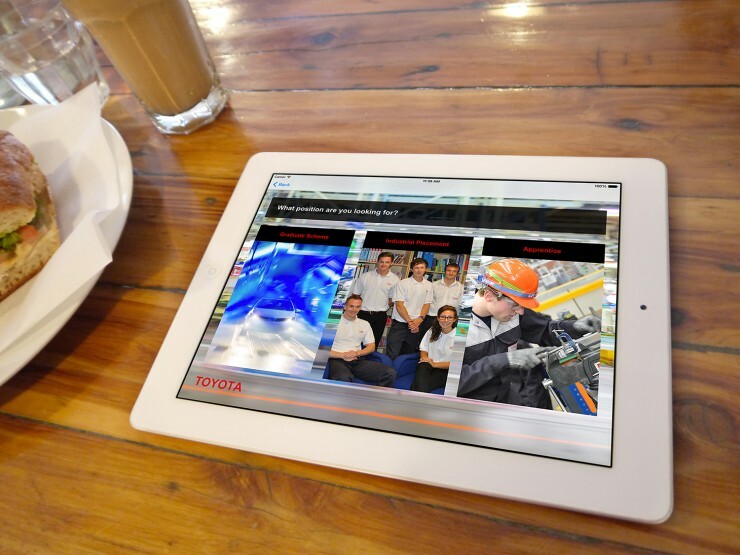 When the recruitment team at Toyota Motor Manufacturing asked us to develop a new iPad App we jumped at the chance. The recruitment team at needed the app which is easy to use and navigate. So we had to make the app as user friendly as possible. The iPad app was to be used when the Toyota recruitment team visit a job fair. The app is used to collect contact information from interested applicants for Toyota’s recruitment schemes. Candidates who may be interested in working for Toyota fill in a simple form on an iPad with their contact details. All of the applicant information is saved onto the iPad until the team gets back to the office. Then all the potential candidates’ details are saved to the recruitment system database. When a recruitment program is due to start, the candidates are notified via email. Thus the applicants are able to apply for a job by accessing the recruitment website. This has greatly improved the application efficiency and cut down on paper work for the recruitment team. Using the app also means that any recruitment campaign will reach a wider audience. This results in a good selection of potentially high quality applicants for Toyota Motor Manufacturing. We created something completely unique for Toyota which has helped to improve their recruitment process.